The White House has been shaken by an explosive Washington Post report on the eve of his return that said Kushner had met with the Russian ambassador prior to Trump's inauguration and proposed a secret communications link to the Kremlin. Donald Trump has not directly addressed the allegations of the secret line to Moscow. 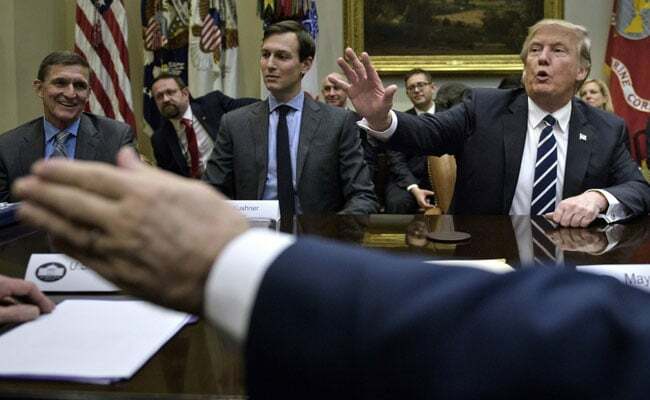 Washington: A rattled White House braced Monday for a fresh wave of scrutiny in the ever-widening investigation into Russian election meddling, as President Donald Trump rallied behind his embattled son-in-law and top aide Jared Kushner. The US leader visited Arlington National Cemetery to mark Memorial Day, a day of remembrance for the nation's war dead, but had to quickly pivot his attention to the Russia scandal after returning to Washington late Saturday from his first international trip since taking office. The talks between Kushner and the Russians, if confirmed, would raise new questions about the Trump team's relationship with Moscow, which US intelligence agencies say tried to sway the November election in the property tycoon's favor. Trump has not directly addressed the allegations of the secret line to Moscow, but took to Twitter after his return to Washington to dismiss White House leaks as "fabricated lies" and "fake news." He declared his "total confidence" in Kushner, who boasts an enormous portfolio of domestic and international responsibilities, underscoring his importance as Trump's chief adviser despite having no experience in politics before the 2016 White House race. "Jared is doing a great job for the country," Trump said in a statement provided late Sunday to the New York Times. "I have total confidence in him. He is respected by virtually everyone and is working on programs that will save our country billions of dollars. In addition to that, and perhaps more importantly, he is a very good person." According to US media, the secret line was never established. Nevertheless, some critics have called for Kushner's security clearance to be revoked, while others say he should temporarily step aside while his ties to Moscow are being reviewed. Senior administration officials have brushed off concerns of a back-channel link. National Security Advisor H.R. McMaster said that generally speaking, "we have back-channel communication with a number of countries... I would not be concerned about it." Homeland Security Secretary John Kelly agreed. "Any way that you can communicate with people, particularly organizations that are maybe not particularly friendly to us, is a good thing," he said. Washington is waiting with bated breath for Senate testimony by former FBI director James Comey, who was fired by Trump as he oversaw an investigation into possible collusion between the Republican's campaign and Moscow. The testimony is expected in the coming days, though a time has not been set. US media have reported that Trump had pressed Comey in meetings and phone calls to pull back on the investigation. The White House has denied that Trump pressured Comey in any way, though the FBI director is believed to have written detailed memos on his discussions with the president that indicate the opposite. Trump spent Sunday meeting with attorneys at the White House, presumably to set strategy for dealing with the Russia investigation that has largely sidetracked his legislative agenda.